Hiram was born in December 24, 1956 to Carlos W. and Mary (Rogers) Lyon in Zanesville, Ohio and was the younger brother of Lewis W. Lyon. His parents were among the first settlers in the state of Ohio. He received his early education in St. Paul and Wabasha Minnesota schools. He attended Hood College in Red Wing, MN and the State Normal College in Oshkosh Wisconsin but finished his formal education at the University of Minnesota in Minneapolis. After only a year as bank messenger, he was promoted to assistant cashier at the First National Bank of St. Paul. After gaining two more years of experience, he left for Mandan in 1881. He was one of the organizers of the First National Bank of Mandan, financed by a St. Paul area uncle by the name of Tarbos. Lyon served as cashier for many years before becoming its president. 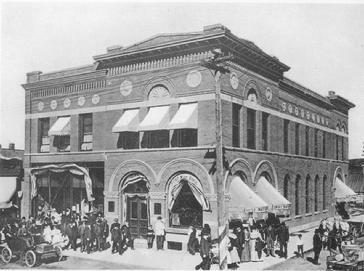 In 1890, he acquired the Mandan Mercantile Company. Under his direction, Lyon grew it to become one of the leading lumber and machinery concerns in North Dakota, ultimately expanding to thirty-six locations in the Missouri Slope region. In 1899, Lyon bought an existing mill and organized the Missouri Valley Milling Company. Its premium grade of flour was trademarked as "Lyon's Best." In June 1909, the operations at Mandan, Bismarck and Dickinson was sold to the Russell-Miller Milling Company of Minneapolis. Their "Occident" brand premium flour was capturing the market, and the company subsequently operated 12 flour mills between Billings and Philadelphia. The transaction also included the Lyon Elevator Company and C.G. Ireys Elevator Company, both of Minneapolis. 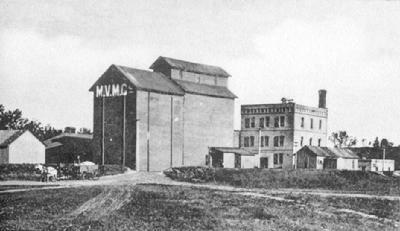 At the time, the Missouri Valley Milling Company consisted of three flour mills (Mandan, Dickinson and Bismarck) and several elevators. The Lyon Elevator Company owned 41 country elevators and the C.G. Ireys Company owned 21 elevators in North Dakota. He entered the Russell-Miller Milling Company as vice president after its merger with his holdings. Other business he established included the Mandan Electric Company, the Mandan Telephone and North Dakota Independent Telephone Companies, and the Missouri Valley Grocery. His other investments include sheep including 700 head of sheep he purchased from the Black Hills area in July 1882. The trip home took 16 days and they were placed on the Lyon ranch on the Little Heart River near Taylor, ND. He was also responsible for the placement of thousands of head on Morton County farms, on shares. He was elected president of the Mandan Produce and Creamery in May 1889 (the forerunner of today's Cloverdale Meats). He married on June 1, 1892 Pauline Meech (widow of Charles E. Meech, former president of Northern Pacific Bank of Mandan). Mrs. Lyon was the daughter of Christine (von Stein) and Jacob Wentz. Both her parents came to the US in 1841 from Braden Braden Germany and were among the first settlers in the Iowa City, Iowa region. 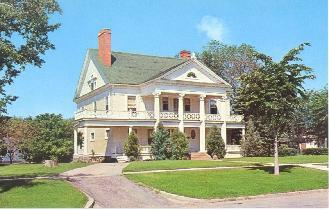 The Lyon's wealth was apparent as they were the only family in the city with a fulltime coachman. Another household servant included young Russian immigrant Vronie Helbling. The Lyons, which included daughter Caroline Rogers (b. Sept 1893) and stepson Robert Lyon Meech (b. Mar 1885), lived at 309 4th Ave NW. Their home was styled after a southern plantation home with massive pillars along the front to support the porte-cochere - the French word for carriage driveway. 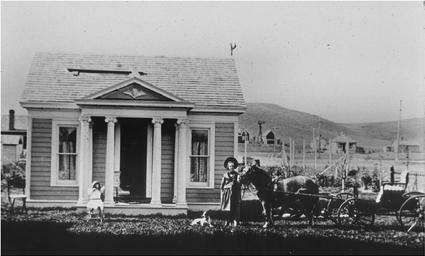 Caroline's play house was patterned after the main house. While in Mandan, the family were members of the Christ Episcopal Church. Thorughout his life, Hiram was reportedly very generous with his support of churches and "worthy benevolent and charitable enterprises." He was active in Republican Party politics. After leaving Mandan in early 1907 after the sale of his interest in flour mills and grain elevators to the Russell-Miller Milling Company, Lyon returned to St. Paul Minnesota to assume a corporate vice-residency. Together with C.B. Mills and George F. Orde, he also started the National City Bank. He was its president. In 1917, it merged with the Scandinavian American National Bank which was renamed Midland National Bank. 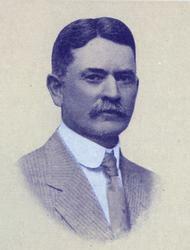 He relinquished the presidency in 1919 and assumed the role as the bank's Chairman of the Board. Mr. Lyon was fond of sightseeing and traveled extensively in both this country and to Europe. He and his family had spent several winters in Pasadena, California and in 1916 he bought property there and built another beautiful home in the Oak Knoll section. He retired in 1920 and moved permanently to his Pasadena home where he died on March 12, 1921. At the time of his death, Mr. Lyon was vice-president of Electric Steel Manufacturing Company of Minneapolis, president of the Northland Security Company, Minneapolis, and president of the Occidental Elevator Company.